Yahoo has been on the road to revival, relaunching and redesigning core properties like Mail Yahoo Redesigns Mail For Web, Mobile And Windows, Offers 1TB Storage & Conversations View Yahoo Redesigns Mail For Web, Mobile And Windows, Offers 1TB Storage & Conversations View Yahoo is setting its eyes on the prize: email. For its 16th birthday, Yahoo Mail got a whole new look across platforms, and a few new features too. Read More , Maps Yahoo Moves Ahead On The Revival Road With The New Yahoo Maps Yahoo Moves Ahead On The Revival Road With The New Yahoo Maps A refreshed Yahoo Maps for the desktop comes to U.S. users. The new Yahoo Maps comes with a slew of new features and more interactivity but missing an equivalent mobile app so far. Read More , Answers, My Yahoo The New My Yahoo Gets A New Design To Emerge As An iGoogle Alternative The New My Yahoo Gets A New Design To Emerge As An iGoogle Alternative Yahoo isn't pulling any stops in its efforts to personalize the user experience for you. In the latest move, it has dusted off My Yahoo and given the personal start page a fresh look. Read More and Flickr. Its now turned its attention to a place that has been the refuge for casual online gamers: Yahoo Games. 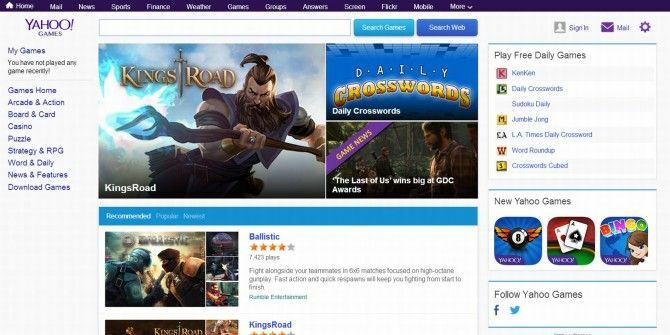 The new Yahoo Games Network bring the classics that we all know and love — like Yahoo Poker, Yahoo Pool, and Yahoo Bingo — in addition to other hits like KingsRoad, The Last Stand: Deadzone, Ballistic, Bingo Blingo, Rise of Mythos, Vegas World and Slotomania. We’re already working with some of the best developers in the industry like Rumble Entertainment, DreamWorks, SGN, ChangYou, Namco Bandai America, Playtika, FlowPlay, Con Artist Games and many more on web and mobile. The web giant also released a new initiative, the Yahoo Games Network, which will help developers tap the 800 million Yahoo users worldwide. The network helps developers with distribution, easy onboard services that help them authenticate players, monetizing their games, providing social sharing, analytics and ongoing operational support for growth. You can find out more about that at gamesnet.yahoo.com. You can head to games.yahoo.com to start playing right away, but we do recommend you improve the performance of Flash games 4 Ways To Improve The Performance Of Flash Games 4 Ways To Improve The Performance Of Flash Games When it comes to casual gaming, Flash may be the very best platform to play on. The Flash client has one distinct advantage over alternatives, and that's the fact that it can be played within... Read More before you do that. Explore more about: Online Games, Yahoo.